Currently viewing the category: "Thistle – general"
Recently Thistle fan Paul4Jags decided to jog a route around all the sites of Partick Thistle’s old grounds, starting at Overnewton and ending at Firhill, a route of 13 kilometres. Paul recorded his run at his entertaining blog. Iain Macdonald and Stuart Deans recently alerted me to the existence of film of the 1921 Scottish Cup 4th round match between Thistle and Motherwell, played at Fir Park on 5 March 1921. Coverage of the Thistle game starts at around 2 minutes, after you have watched a Motherwell v Ayr match. A team goup photograph from the 1952-53 season has recently been discovered. View film of the 1925 Junior Cup Final played at Firhill. 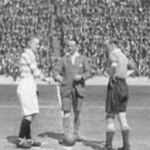 Pathe News archive footage of the 1921 Scottish Cup Final.